Where Will the D2 Subway go? We’ve been listening to stakeholders, public officials, technical experts and the public, and we’re on our way to finding a locally preferred alternative (LPA) that we can submit to the Federal Transit Administration (FTA) in September. 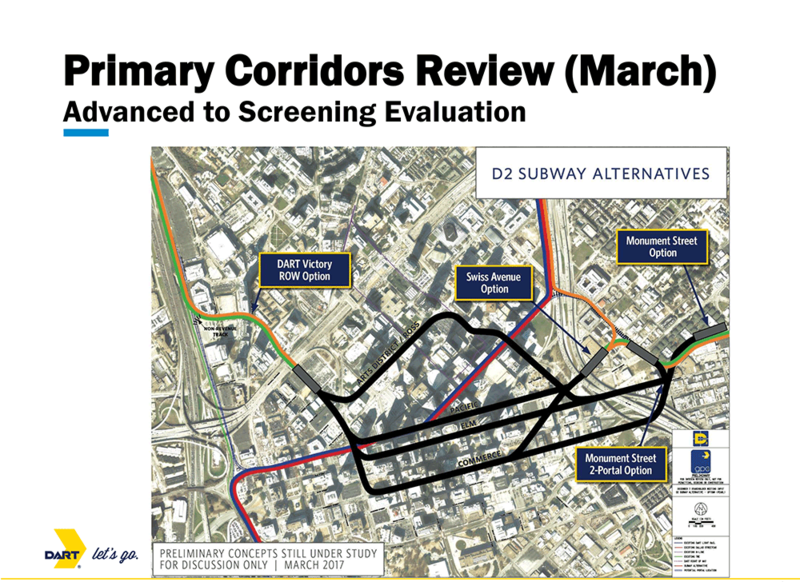 By January, DART had identified four primary D2 Subway alternatives, along with four options for the subway points of exit and entry. When starting this process, we evaluated many different alternative routes that were brought forth by stakeholders and the public. Based on further input and a screening evaluation conducted in March, DART staff recommends three alternatives be studied in further detail. Endpoints are especially important when building a subway. 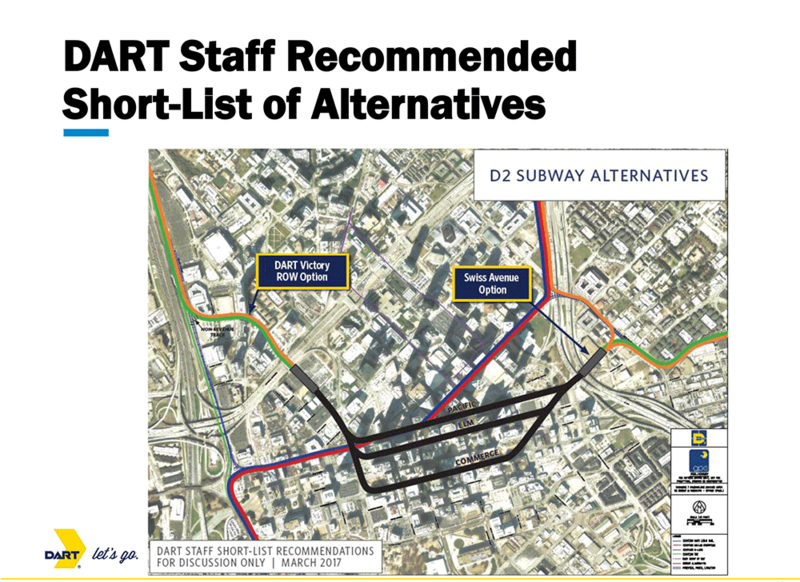 The D2 Subway should connect to the larger DART system, and provide flexibility so DART can move people around the system as needed, whether it be for daily operations, special events or incidents in downtown. Each of these exit and entries bring their own unique set of benefits and challenges. Swiss Avenue option or Monument Street option could serve as the east side exit and entry point for the D2 Subway. The Railroad Corridor option or Victory Street Right of Way option could serve as the west side exit and entry point for the D2 Subway. The Railroad Corridor presents feasibility and risk issues, as the surrounding soft soil would require special machinery, construction of a tunnel could impact existing structures in historic Dealey Plaza, as well as the lack of a station to serve a new market area. Similarly, the Monument Street option does not provide operation flexibility, causes significant residential displacements, and would have some permanent street closures and impacts. Based on a technical assessment and stakeholder input, the Railroad Corridor was recommended to not advance further, and the Monument Street option was modified to also include a 2-portal option that provides operational flexibility that DART needs. The recommended short list only includes the Swiss Avenue and the Victory Right of Way options for the entries/exits for the D2 Subway. 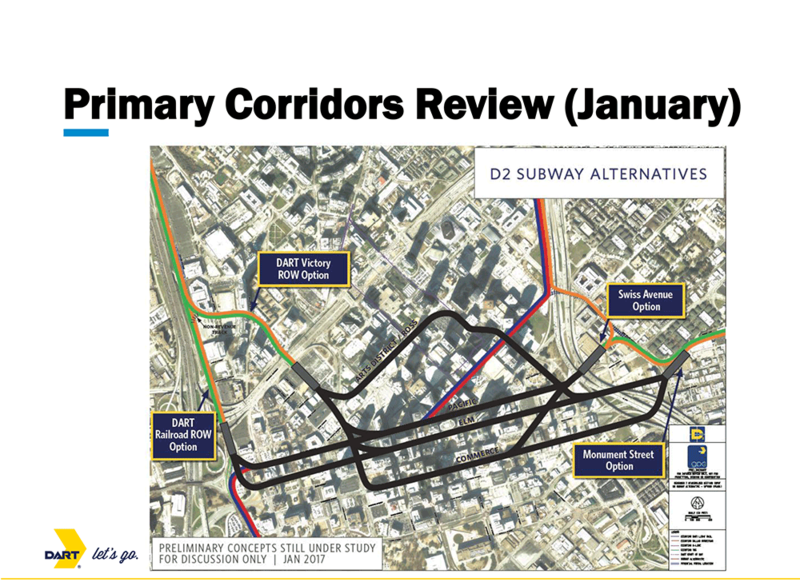 Based on the evaluation, DART has determined three potential streets the D2 Subway could run parallel to below ground. Pacific: D2 Subway would go under the existing corridor. Elm: D2 Subway would be one blocks south of existing corridor. Commerce: D2 Subway would be three blocks south of existing corridor. DART will continue to seek feedback from the public and stakeholders to understand which location is the most prudent and feasible route for the D2 Subway. 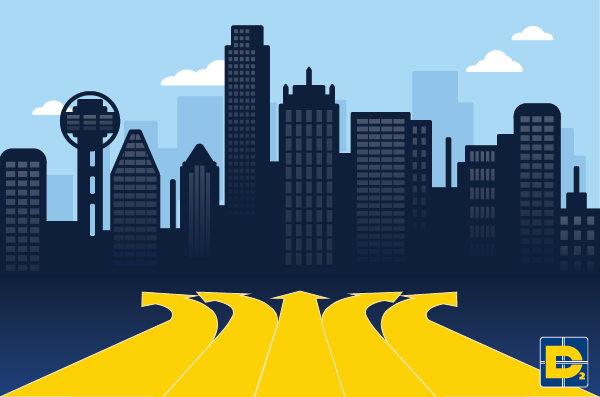 DART is assessing each route to find the best path for the D2 Subway that brings the most value and accessibility to the region. The DART Board of Directors will make the final judgement on a recommended alternative and we’ll finalize this with the Dallas City Council. As we’ve said before, finding a route we can agree upon and a route that works for North Texas is an iterative process. In the coming weeks we will dive more into depth on each of these routes to unpack the unique benefits and challenges each path provides. 1 Response to Where Will the D2 Subway go?